Above: These Baltimore student-rowers have been competing in Pennsylvania and New York and practicing three-times-a-week on the Middle Branch. All was silent in this corner of Baltimore Harbor, except for the simultaneous slapping sound of 16 oars hitting the surface of the water, as nine city middle and high school girls powered their crew boat forward. The motion of the boat over the steely-blue Middle Branch, as it gained momentum with each stroke, was beautiful. But even more captivating was the idea that the effort of making it slice along efficiently might help the girls focus on their academics and future college degree. Joseph is one of the participants in Reach High Baltimore, a program open to 12 to 17-year-old city students that is aimed at helping them succeed in school and life, as well as excel in rowing crew competitively. “If our kids do not go to a college on rowing and academic scholarships then we have not reached out goal,” said Judd Anderson, who coaches the Reach High program along with his wife, Evy Anderson. Anderson, executive director of Reach High, took some time to talk to The Brew about the unique program he directs that began putting kids in racing shells on the Middle Branch last year. This year 15 girls and six boys are participating. 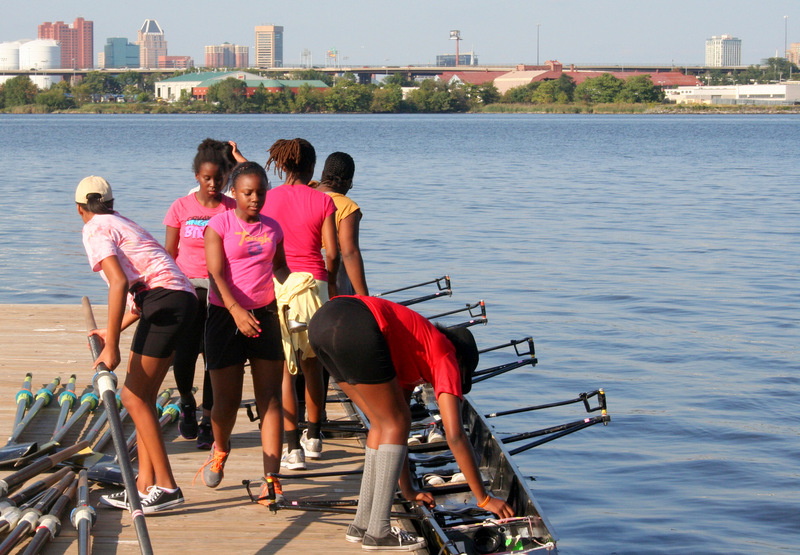 Supported by the Baltimore Rowing Club, developer Patrick Turner, Honeywell and other corporations and individuals, Reach High gives participants from some of the city’s poorest communities the skills – and entree – to a sport that traditionally has been the province of America’s wealthy students and elite universities. While there’s no way to guarantee that the Reach High rowers’ efforts will pay off with college scholarships, the program has given them a glimpse of those schools and other places beyond Baltimore and, perhaps, motivation. 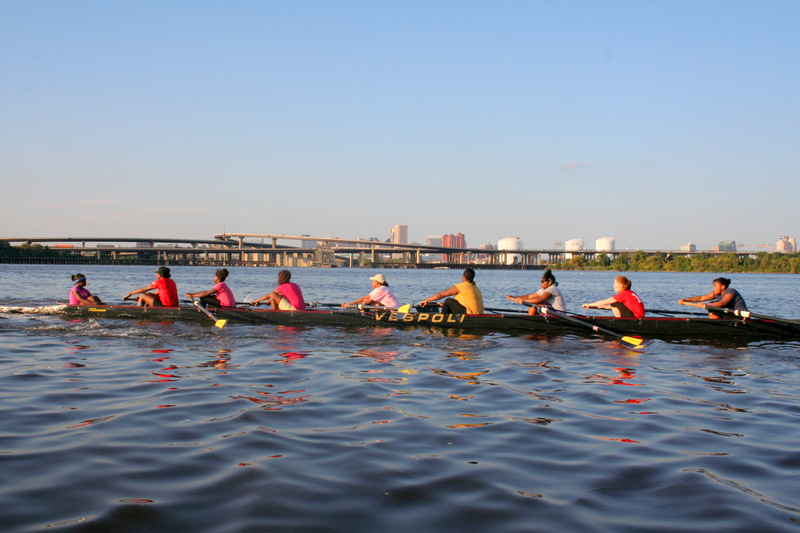 Every time they’d get ahead, Anderson explained at a recent presentation about the program to the city school board, some rower would accidentally put an oar in the water at the wrong time (“catch a crab”) and slow down the boat. Still they saw their speed and glimpsed their potential, he said. The girls all pull as team on the boat, but have developed personal goals as well. Johari, for instance, plans to apply to a Catholic high school that has a rowing team. She explained that she learned about the rowing program from Judd Anderson, when she met him at her brother’s back-to-school night. Before that, she said, her only non-academic activity was modeling. “Now, I’m glad I quit that,” she said. These days, along with rowing, she’s focused on studying for the exam she must pass to get into the high school she hopes to attend. Every Tuesday, she studies for the big test. “It’s supposedly three hours long,” she said. Along with improving her rowing, passing it is the goal she wants to achieve by the end of the year. At one of the girls’ recent two-hour practices, meanwhile, it’s all about collective discipline and working as a team. They meet every Monday, Wednesday, and Friday at the Baltimore Aquatics and Resource Center on Waterview Avenue. Together – the only way it’s possible to carry a fragile 200-pound racing scull – the girls get the boat out of the shed and bring it down to the dock to debark. Once in the boat, the teamwork continues. There, eight girls row at the direction of coxswain Ayanna Roberts, who repeats Coach Judd’s instructions to the eight. “Square and feather drill, ten strokes on the square! Then, feather for ten- stern four!” Ayanna says into her microphone. The girls, who have mastered the rowing vernacular as a second language, understand Ayanna’s commands. Immediately, the four girls in the back end of the boat start rowing. (Stern four refers to the four girls farthest from the coxswain; if Iona had called out ‘bow four,’ the four girls closest to her would stroke). “No talking to Ceci,” Ayanna reminds Johari, who is not a rower in stern four. The four who are not rowing are quiet and respect the four girls who need to concentrate during this complicated drill. “Rowing on the square” means that the girls practice cutting the blade cleanly into the water and maintaining synchronized paddle strokes. “Feathering” means that the girls practice rotating the oar with a twist of the wrist, so it travels through the air parallel to the water. While they do this, Coach Judd calls other rowers to join in. “Four! Three!” he shouts from a motorboat, sputtering along at low speed to keep up with the rowing boat. Ayanna repeats the instruction and two more girls start rowing, in the rhythm already set by their teammates. Finally all the girls join the original stern four and the boat reaches a powerful, awesome speed, every girl listening attentively to the coxswain. Afterwards, Cydney Greene talks about that moment.